Despite widespread prevalence of pain and the high volume of pain medications used in the U.S., a new nationwide survey, "Understanding America's Pain," reveals many people lack a basic understanding about non-steroidal anti-inflammatory drugs (NSAIDs), including the risks associated with them. In 2014, 123 million prescriptions were filled for NSAIDs in the U.S.,1 and it is reported that one-third of the general population have used OTC NSAIDs.2 However, the “Understanding America’s Pain” Survey shows many Americans who take pain medications are not aware of the risks associated with these widely used products. 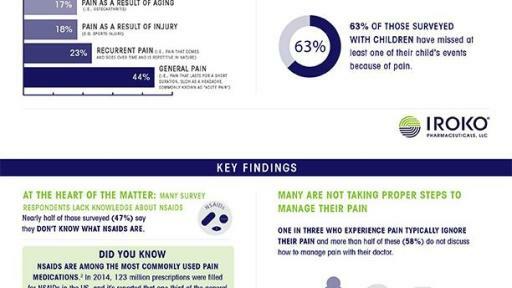 The results of the “Understanding America’s Pain” Survey were announced by Iroko Pharmaceuticals, LLC to coincide with National Public Health Week, which is intended to raise awareness of issues that are important to the well-being of the nation. “This survey provides the patient perspective regarding commonly used pain medications and highlights the need for further education. Iroko is committed to educating patients regarding the U.S. Food and Drug Administration’s (FDA) recommendation to use the lowest effective NSAID dose for the shortest duration,” said Dr. Clarence L. Young, Senior Vice President and Chief Medical Officer of Iroko Pharmaceuticals. There is a lack of general awareness around NSAIDs: Nearly half of those surveyed (47%) say they do not know what NSAIDs are. People incorrectly identify common NSAIDs: Many who responded saying that they are aware of NSAIDs, failed to correctly identify common pain-relievers, such as believing ibuprofen (42%) does not belong to the NSAID class of medicine. Many medication users aren't fully aware of the risks associated with NSAIDs: Approximately half of medication users (58%) acknowledge that there are risks associated with NSAIDs, but only 27% are aware of the U.S. FDA recommendations to use the lowest effective dose for the shortest duration. Side effects are prevalent: Among those who take prescription NSAIDs or OTC pain medication, 62% experienced at least one side effect. Pain is being inadequately controlled: Only 3 in 10 (31%) who experience pain feel that their pain is completely controlled and only half (48%) of medication users say they are very confident that the medications they take are the safest and most effective for their pain symptoms. Iroko is consulting with the Arthritis Foundation to further evaluate the survey findings and provide vital insight into a patient population with ongoing pain management issues. The Arthritis Foundation plans to conduct additional research with their constituents to learn more about pain (levels of pain they experience, how pain impacts their lives and their pain management techniques) and identify any similar knowledge gaps that may exist among people with arthritis. The results of the Arthritis Foundation’s study are forthcoming. People ignore their pain: About one in three people (34%) who have pain admit that they typically ignore it. Pain disrupts everyday activities: In spite of their efforts to treat pain, Americans report that pain disrupts normal, everyday activities, such as exercise (57%), walking (45%), household chores (45%) and even sexual activity (40%); six in 10 (63%) Americans with children have missed at least one of their child’s events because of pain. People are not discussing pain with their doctors: Many who experience pain are not discussing pain management or treatment options with a healthcare professional. Almost 6 in 10 (58%) do not discuss how to manage pain with their doctor and 54% are not taking the opportunity to consult a doctor about the steps they take to relieve pain. People are unaware of low-dose pain medications: Many medication users (52%) are not aware of low dose pain medication options. For more details regarding the survey findings, visit here. The survey was funded by Iroko and conducted by Kelton Global between December 15th and December 21st, 2015 among 1,056 nationally representative Americans 18+ years old who reflect the general population of the United States. Participants were enrolled using an e-mail invitation and an online survey. A medication user was defined as respondents who have taken prescription nonsteroidal anti-inflammatory drugs (NSAIDs) or over-the-counter (OTC) pain medication in the last 12 months (n=608). 1 IMS National Prescription Audit, Total Prescriptions, 2010-2014. 3 U.S. Food and Drug Administration. 2015 Drug Safety Announcement. FDA Drug Safety Communication: FDA strengthens warning that non-aspirin nonsteroidal anti-inflammatory drugs (NSAIDs) can cause heart attacks or strokes. http://www.fda.gov/Drugs/DrugSafety/ucm451800.htm. Accessed February 3, 2016. 4 McGettigan P, et al. Cardiovascular risk with non-steroidal anti-inflammatory drugs: systematic review of population-based controlled observational studies. PLoS Med. 2011; 8(9):1-18. 5 Helin-Salmivaara A, et al. Eur Heart J. 2006;27(14):1657-1663. 6 U.S. Food and Drug Administration. 2005 Public Health Advisory - FDA Announces Important Changes and Additional Warnings for COX-2 Selective and Non-Selective Non-Steroidal Anti-Inflammatory Drugs (NSAIDs). http://www.fda.gov/Drugs/DrugSafety/PostmarketDrugSafetyInformationforPatientsandProviders/ucm150314.htm. Accessed February 17, 2016.